View More In TIG Welding Equipment. 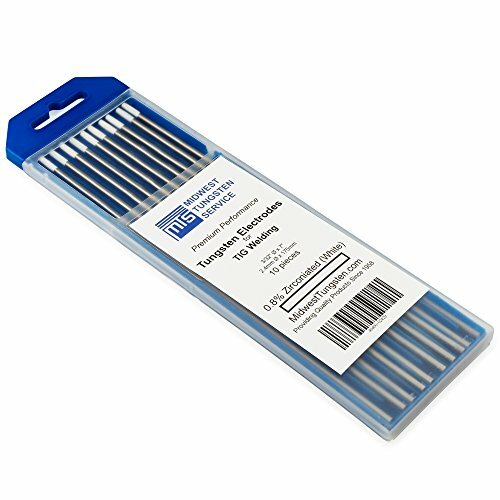 A welder's best friend, this ten pack of white zirconiated WZ8 3/32" x 7" TIG welding tungsten electrodes will help you get the job done. Engineered to exact specifications, you can count on these long-lasting electrodes to perform during your most difficult welding application, time and time again. With reliable arc-striking and a low burn-off rate, these electrodes maintain the highest quality of arc while adhering to ANSI and AWS standards. Sixty years of experience have culminated into these premium quality TIG welding tungsten electrodes, and you can benefit from that experience. If you have any questions about this product by Midwest Tungsten Service, contact us by completing and submitting the form below. If you are looking for a specif part number, please include it with your message.